The Operation Olive Branch has been launched in Syria's northwestern Afrin region to clear terrorist groups such as the PKK and its affiliates KCK, PYD, YPG; and Daesh, the Turkish Armed Forces (TSK) said Saturday in a statement. The operation has been launched as of Jan. 20, 5:00 p.m. to neutralize terrorist groups and liberate friendly and brotherly people of the region from oppression and tyranny, it added, noting that the operation aims to provide security and stability along Turkey's borders and in the region. The operation complies with international law, U.N. Security Council resolutions, especially No. 1624 (2005), 2170 (2014) and 2178 (2014); and Article 51 of the U.N. Charter on Right of Self Defense, the statement said. It underlined that during the operation's planning and conduct, only terrorists and their shelters, weapons, vehicles and tools are being targeted and utmost care is being shown for civilians not to be harmed. 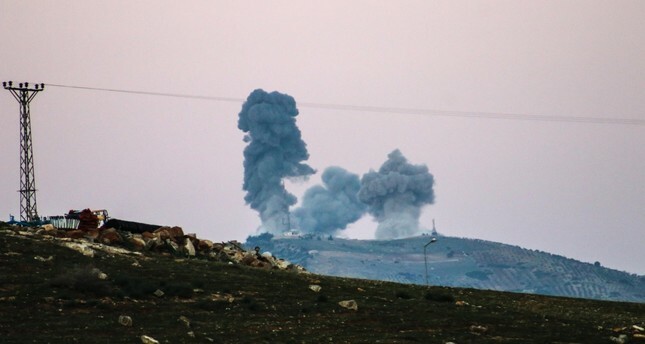 While ground troops located in Kilis province near the Syrian border aim at PKK/PYD targets with howitzers, tank units, multiple rocket launchers, Turkish warplanes target previously identified terrorists in an air operation, media sources reported. Rising smoke were observed from places near the Turkish-Syrian border, reports said. The TSK also warned that YPG and Daesh members were trying to claim that terrorists who were shot during Operation Olive Branch were civilians, adding that 108 out of 113 previously identified terrorist targets were hit in Afrin. Some 72 Turkish warplanes participated in the operation targeting seven regions in the counter-terror operation, the TSK said later, adding that the warplanes safely returned to their bases. Foreign Minister Mevlüt Çavuşoğlu confirmed later on Saturday that both ground troops and F-16 warplanes were being used in Operation Olive Branch, underlining that o civilians were targeted and all current casualties were only YPG terrorists with uniforms. "We expect from our allies to stand by Turkey in this issue, but we are taking our steps alone to secure our borders," Çavuşoğlu added. The foreign minister also said that a written information was given to the Assad regime regarding Turkey's ongoing operation in the Afrin region. Meanwhile, the Interfax news agency cited the Russian Defense Ministry, saying that Russian military operational groups and military police were relocated from Afrin. The mission chiefs employed by U.S., Iranian and Russian embassies were also invited to the Foreign Ministry in Ankara to be given a briefing on the latest developments in Afrin, in addition to the ambassadors of United Kingdom, France and China.